Today, Western nations are forced to consider the price and flow of crude oil in all foreign policy decisions concerning the Middle East. From Algeria to Iran, Oil is King. However, back in 1861, petroleum was not yet a major commodity for world markets. Instead, a major commodity was cotton. America’s South had developed an important economic position in world markets by harvesting and exporting cotton to European markets. In 1860, the United States exported over four million bales of cotton to Europe, with each bale weighing 500 pounds. The largest importer of US cotton exports was Great Britain. American cotton was one of the two major ingredients in profitable textile mills in England. The other critical ingredient was cheap labor, and the UK had plenty of that, as well. The cash that flowed into the South allowed it to import goods from Northern factories, mills, and foundries. 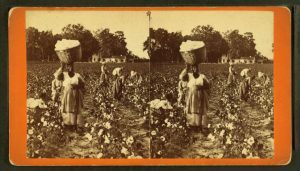 The cotton formula was simple, and the Southern states had the long growing season and four million slaves to make cotton farming highly profitable. Many Southern leaders saw themselves as key players in the global market. As far as they were concerned, cotton was essential to Europe’s economy. Today when we look back at the Civil War, we might wonder why the less-populated, less-industrialized South would have considered a war with its Northern neighbors. In 1860, Southern states had a population of nine million citizens and nearly four million slaves. The Union population was twenty-two million. The Northern states could boast of having ten times as much manufacturing production as the South. And, in particular, Southern states produced almost no military equipment or firearms. To add to the disparity, the Northern states operated with a single, standard railroad gauge covering nearly 98% of Northern routes. An engine in New York could, and did, run just as easily in Michigan. In the South, one symptom of “states rights” parochialism could be seen in its railroads. It had railroads but no railroad system. An individual investor built in any fashion that he saw fit. An engine in Virginia would not only not work in Mississippi, it likely wouldn’t even be able to traverse the state of Virginia. That lack of cooperative planning and central regulation haunted the South throughout the duration of the Confederacy. On the eve of the American Civil War, the North had the guns, the manufacturing capability and the manpower. The South had cotton and four million slaves. When the odds are considered, the North would have seemed to have a clear advantage. Image by J.N. Wilson, public domain. Located at NY Public Library. However, the South was counting on three factors not normally reported in censuses and almanacs. First, it was counting on fighting a defensive war, and it had no need to invade the North. The Union army would have to invade the South to recapture it and force its re-entry into the Union. Given the weapons available in 1861, being outnumbered two and a half to one was considered an even match. Trained military leaders with Southern sympathies would not have encouraged secession from the Union if a secession would have required “conquering” Northern states. Second, and more subtle, the Southern leaders calculated nearly correctly the unwillingness of “lazy city folks” in the North to enter military service and campaign in the South to free slaves that, in the South’s estimation, most of them cared nothing about. The third “ace up the sleeve” was the 1861 equivalent of an OPEC oil embargo. 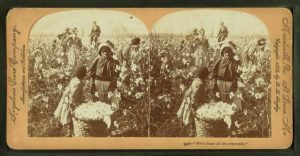 The South knew, or thought they knew, that European nations would not tolerate an interruption in cotton trade. In weighing the odds for war, many Southern leaders were confident that Europe would threaten intervention and coerce the US to accept the Confederacy’s independence. Guns, ammunition, and the massive mountains of manufactured goods required to feed the glutinous gods of war would flow from Europe like oxen to the sacrificial altar. 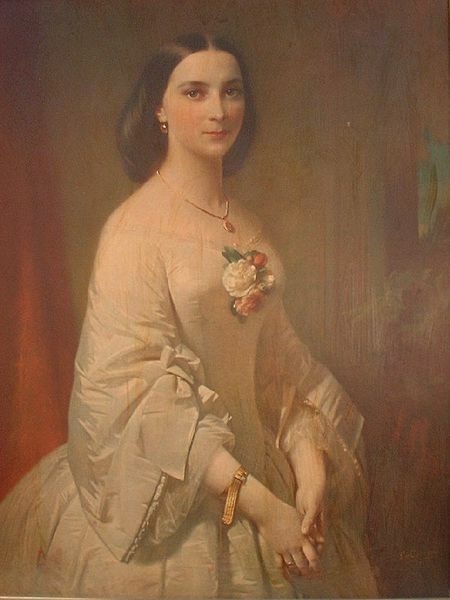 By Erich Correns, public domain. Somewhere between the certainty of a bright Confederate future and Appomattox Courthouse, something went wrong for the South. On a pleasant spring day on April 12, 1861 amidst a carnival atmosphere with well-dressed, picnicking revelers, Confederate General Pierre Gustave Tautant Beauregard ordered his artillery to open fire on Union-occupied Fort Sumter in the Charleston harbor in South Carolina. A merry time was had by all except for Union Colonel Anderson and the men trapped in the fort. After thirty-four hours of bombardment, Anderson was allowed to withdraw his men by way of a Union Navy ship, and in exchange for safe passage, the remains of the fort were surrendered to the Confederacy. Beauregard was hailed as a Caesar by the jubilant picnickers and by their cousins across the South. Four hellish years and 630,000 dead Americans later, the spring picnic seemed somewhat less splendid. Gate to Gettysburg local cemetery, which became a battleground. The Southerners had calculated the odds of defensive action correctly. Their basic suppositions about the size of the Union forces needed were accurate enough. What was less accurate was their supposition that Northern couch potatoes would not fight. They did. Even after suffering the horrendous casualties while attacking prepared positions at numerous battles, the North still managed to fill the ranks of the Union Army and equip it. The Southerners had not calculated that Northerners would be willing to pay such a high price in blood to defeat the Confederacy. They were wrong, and the South’s mighty monarch King Cotton had an accidental hand in assisting Union Army recruiters. The Confederacy was not altogether surprised at England’s reluctance to send its navy to defeat Union Navy blockade of its ports. However, the South was accustomed to life in a democracy and was prepared to coax the Parliament and Queen into seeing the “Southern light.” Southerners knew that Queen Victoria considered slavery an abomination and was reluctant to defend the interests of wealthy slave owners in a fight against the US, so the South played the Cotton Card. . . . It stopped exporting cotton to England. An island nation with mothers who can’t cook, artists who can barely paint , and army officers who buy their commissions does not come to rule the waves by being stupid. Great Britain saw that Southern move coming. 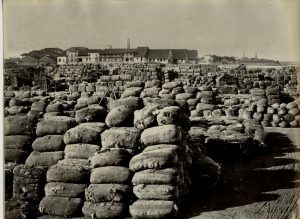 Cotton bales at Bombay port in 1860s. Great Britain had been at the trade game for a long time, and they were good at it. Unlike the British Army, the British Navy was a well-run meritocracy, and it communicated well with British governments and merchant marine by way of its Admiralty staff. In 1860, a bumper crop of cotton glutted the markets, and England was organized and disciplined enough to invest substantial long term capital in stockpiling it. Also, far from London, and even farther from the cotton fields of the South, British colonial officials in Bombay saw an opportunity in the chaos caused by the anticipated cotton embargo. 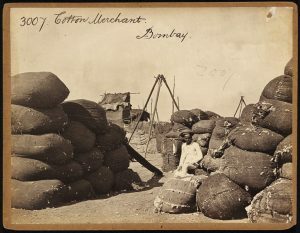 The Bombay area had the perfect climate and soil for cotton growing. It also had something better than slaves. Great Britain had cheap, disposable workers who showed up willingly and worked for less than it cost to operate an American slave. England outsourced its need for the Southern slave labor to India, Egypt, and Africa. 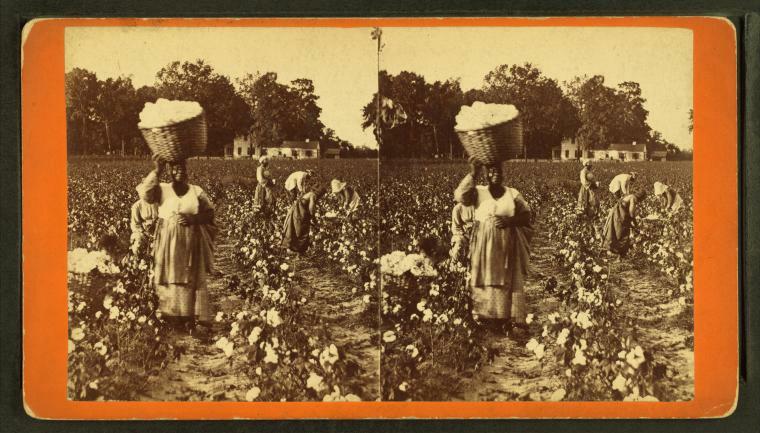 While the shortage of cotton imports from the Confederacy did hurt England, and thousands of English laborers were laid off, the problem was short-lived. Interestingly, even after losing their textile jobs, the British working class remained strongly anti-slavery and pro-Union. Thousands of unemployed Irish, English, and Germans immigrated to the Northern US. Waiting for them on the docks were Army recruiters promising citizenship and bonuses to enlistees. By 1863, many Union regiments had immigrant majorities in their ranks. Cotton production in India, Egypt, and Africa grew quickly. By 1863, England had little concern for what happened to the mountains of cotton bales being stockpiled in the Confederacy. The guns, ammunition, and gold were not forthcoming for the South from Europe except at high prices. Cotton was, in fact, not quite king after all. It was nothing more than a commodity. Across the South and at Gettysburg, Pennsylvania, gravestones mark the resting places of silent witnesses to a war fomented in ignorance and arrogance. Cotton, the plantation elites, and the American President who had to fight almost more against his Northern cohorts than against the Confederates, are all gone. The great-grandsons of the slaves remain, and, although the reconstruction and social evolution have yet to be completed, the Union remains, as well. Do you have any questions about the role of Not-So King Cotton in the Civil War? What do you think we take for granted in the US today that could be outsourced? Thank you for this history lesson from America’s past. In answer to your question, just about everything that is or has been made in the U.S. has been outsourced, from light bulbs to TV sets to solar panels. We still make nice rocket engines and space probe satellites, and we produce a large amount of food. But we are now a part of a truly global economy. Fantastic article that focuses on things that I believe aren’t taught in schools any longer. Very fascinating read! Hi Shawn. Glad you enjoyed it. Thank you for this unique perspective about “outsourcing.” It’s historically significant to note that wealthy Southern colonists supported struggling infant Northern industries (1815-1825) in order to create a more self-sufficient republic or country, by way of tariffs (IE: Tariff of 1816).The South, particularly Carolina farmers, resented apathy from the North when cotton prices shrank from 31 cents a pound (1818) to 8 cents a pound (1831). Convinced that the Tariff of 1828 was unconstitutional, Vice President John C. Calhoun backed the Theory of Nullification while the economic depression of the 1830s choked people in Dixie. Calhoun (b. 1782) died prior to the Civil War, and the South, due to the lack of funding, abandoned his plans for a railroad system (circa 1836) that would’ve ran from Tennessee, crossed the Blue Ridge Mountains and ended at Charleston harbors. Eventually, hot resentment toward Northerners from Southern merchants and farmers boiled into the War Between the States. 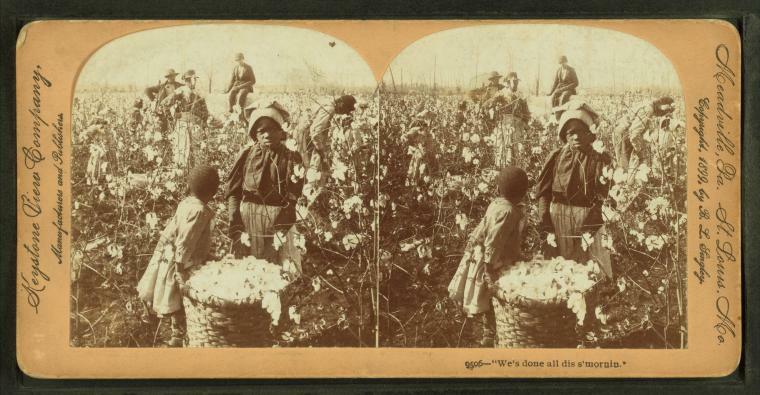 While slaves were freed after the war, many Southerns and their posterity still point to the North’s callous, oppressive business practices as worse than slavery given that desperate Southerners were literally starving by the time Fort Sumter fell. Southerners, some white and few blacks, felt that the North ignored good citizenship, embracing profit over the benefit of the Union. By the 1870s, Northern industries with global financiers swooped onto bankrupt farms in the South, including some that belonged to former slaves. Northern CEOs created the mill system, similar to slavery, within the textile industries of the 19th & 20th Century. Did the South ever economically rebound? Yes. In the last half of the 20th Century, after WWII and the Cold War ended. So what became of John C. Calhoun’s plantation? It did NOT become a Northern interest or business. It’s a global interest. 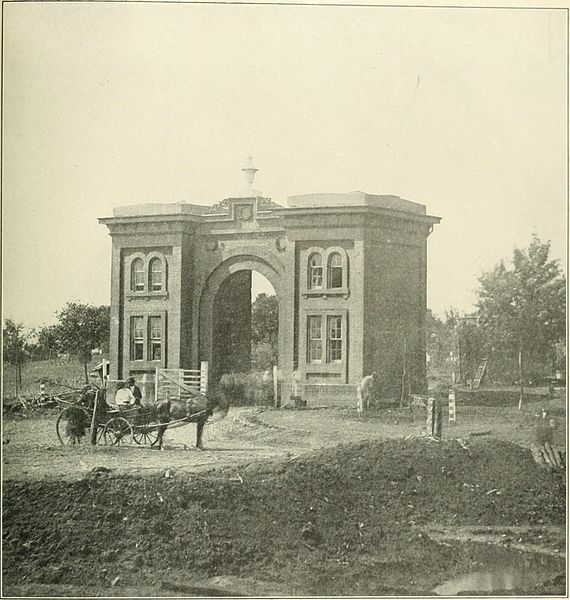 In 1875, Thomas G. Clemson, John C. Calhoun’s son-in-law, bequeathed a cash fortune and land tracts for the development of Clemson Agricultural College, a.k.a. Clemson University. Education provides knowledge and promotes wisdom among students, both local and international. It’s essential in fostering sensitivity to the needs of all peoples, and makes for a more responsive global economics, not the exploitation of human beings via some callous outsourcing strategies. Hi Piper (not my Piper, the other Piper 🙂 ). Thank you for your very thoughtful and informative response. One of the ways the British deflected the effects of the loss of southern cotton at the time was to ramp up their wool imports – there was a ‘wool boom’ in New Zealand on the back of it in the early 1860s, and vast sums of money were made by our pastoralists at the time. (Oddly, the same thing happened in the early 1950s when the Korean War broke out and demand for wool for uniforms soared – our farmers were quick to capitalise). For me what the 1860s experience underscores is the way the world economy was interlinked, even then. Your website should be a MUST READ “Additional Credit” in Grammar School, ( its easy to read), High School (remedial and instructive), an College (repair 12 years of little history, or politically conjectured history). Wonderful stuff. So glad I found your site!